Recessed paper towel dispenser. 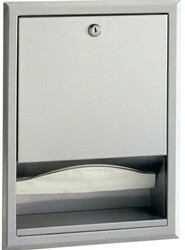 Made from stainless steel and a seamless beveled flange, this commercial paper towel dispenser dispenses 350 C-fold or 475 multifold towels. The door also is equipped with full length stainless steel piano-hinge at bottom and swings down for easy filling. Overall dimensions are 12-3/4 in. W x 5 in. D x 17-3/4 in. H.